Justice is dispensed, System Z style. Not sure what's going on in this comic? Read the earlier episodes in the Main Series to catch up, or read the one-off episodes in the Shorts Series. There will be more I hope. There will be more! Currently in the planning stages. Aaand, I'm left scratching my head. The Zobians dragged him all the way to their home planet, in their sector of distant space, practically threw the book at him for his crimes against their ilk -- which, as far as they're concerned, he intentionally summoned -- only to tell him to go away forever or die? I'm... sure that makes in some way... but, that seems like a lot of trouble to go to. Why couldn't they have just conducted the trial on Plok's planet instead of spending all those fuel units to get him there? I do want to say that I think that twist was pretty amazing, though. I absolutely did not see it coming. They're a funny bunch. You should hear the story about the Green Eye of Zub. Sort of a weak ending after all the drama leading up to this point. And isn't Grandpappy still in the courtroom waiting for his multiplayer update? Am I wrong or is this the first Plok running pose ever drawn in panel 4? Back when the court room storyline started I kinda expected that we would see System Z's society at one point. I hope we can still expect Zob and company in the future. It would be weird if they were gone for good. Anyway I really need to thank you Pickfords for still continuing the strip. Other people would have already abandoned their work after the first hiatus, let alone multiple ones, but you still keep coming through after all those years - It really needs to be said! Looking forward to what will happen next. "You should hear the story about the Green Eye of Zub." Oh? Was Mad Carew at it again? Wow, you guys finished the story before the end of the volume. I kinda assumed it would roll into the next volume. Cool! On another note, what about Grandpappy? Does he know what happened? Hmmm... being released from prison and set free is the "MAXIMUM penalty"? As others have pointed out above, this seems a barely plausible and rather anticlimactic resolution of the story arc (and one leaving loose ends, like Grandpappys voyage to System-Z seeming to have been pointless). The fact that the final episode of volume 5 came an actual week after the prevous one was a surprise as well. It took about 2,5 years for the first four episodes, and almost two years just for episode 5 (the mean time between episodes increased from nine days to about 30 days, i.e. by more than a factor of three). Am I correct with the assumption that new episodes can be expected no earlier than after the coming holiday season (in other words, next year)? Brainfart, I meant "volume(s)" rather than "episode(s)", obviously. Basically, yeah, it looks like Plok got a temporary abrupt happy ending this time so the Pickfords can take a rather longer than usual break. He'll probably run out of fuel and crash back onto Planet Z the minute the next issue begins. Oh! Maybe Volume 5 can be titled "Enemy of the System"
I can definitely see where you are coming from, though I found the comedy of the situation works with the story (that and I'm happy to see Plok free!). That being said, Plok's banishment might be a plot in future storylines. What if for some reason Plok had to travel back to System Z, even though he risks getting arrested (again)? Maybe he and Zob (and Xob) become allies and they have to sneak him into the planet? You can tell I'm very curious about what happens next. $30 for Blubsy 5? Outrageous! Even though it's on sale for about $20 right now, that's also too high. Any going rates on what Plok 2 will cost if it gets made? I have an idea to make Plok 2 a reality, besides selling 1 million comic books. Simply re-market Plok as a speedrunning game on various forums and speedrunning communities. You probably didn't play the game in years, but I think if you played it every day for the next year or so, you probably would be fast enough to warrant a challenge to them. Plok then explodes in popularity, becoming one of the most pirated SNES games of all time, therefore demanding a sequel to be made. @Nathan: Plok isn't unknown to retro game speedrunning communities, there are speedruns of it to be found on Youtube and elsewhere. The general problem with Plok is the same as ever - it was "just another platformer" released at a time when platformers had pretty much jumped the shark - even the pivotal Super Mario Bros. series saw its swan song in late 1993 (in the form of Super Mario All-Stars), with the Mario universe then going on to rely on 3D games, Wario/Yoshi spinoffs, RPG spinoffs, remakes etc. for well over a decade onwards. Other problems such as the lack of a means to save a player's progress, a difficulty curve that's a bit rough around the edges, and little to no marketing (as far as I'm aware) pretty much sealed the game's fate as a distant also-ran within the SNES' library. This is just wonderful. I just finished the last page (at the current moment, future people) and I have to say, the humor is great. Interesting that Rockyfella is no longer Plok's enemy but a friend. I always knew that he is not a bad guy but just misunderstood =) I will keep an eye on the comic for sure. @Guest Guest Then make up a stupid lie then. Higane on the SNES was claimed to be a Blockbuster Exclusive to jack up sales prices. Hannah Montana: The Movie on the Wii claimed to have a "backdoor" into hacking the Wii for somebody to troll the entire internet into spending hundreds of dollars on Hannah Montana. Plok deserves a massive lie to make the game notable, and to make it more than a footnote on SNES enthusiast sites (which only talks about the music). Make up a ridiculous lie about this game, and then spam it on 4chan. Well, I don't have any sort of "lies," but Shigeru Miyamoto apparently considered Plok! to be his 3rd-favorite platforming game, during the 90s (right behind Sonic in 2nd and Mario in 1st). >Make up a ridiculous lie about this game, and then spam it on 4chan. That hardly would do do any good because, as mentioned, Plok is known to /vr/ (and other boards probably won't care much about some SNES game from 24 years ago anyway). 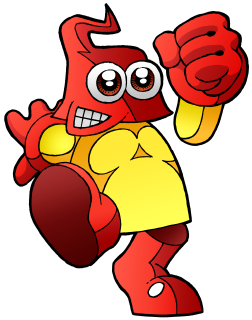 The way Plok is viewed there is surprisingly well captured by the very first episodes of the comic (namely, a somewhat failed game character who is bitter about his only game not having been the success it could have been, and butthurt about other game characters like Bubsy or Rayman having received the success and sequels Plok believes belong to him). I just don't see how at this point you could pull it off to make Plok go viral and sigificantly raise the game's recognition and appreciation. >Shigeru Miyamoto apparently considered Plok! to be his 3rd-favorite platforming game, during the 90s (right behind Sonic in 2nd and Mario in 1st). The version usually heard is that back when Nintendo was interested in Plok, Miyamoto supposedly offered to help making Plok the third most renowned platform game character (after Mario and Sonic). I suppose Ste and John can say much more about that and clear up how much of that is true and how much are just myths/rumours. Speaking of bubsy, i'm getting a little tired of a certain someone using the comments section as their platform to rant about a random game and invest way too much energy in it. Not you, Guest guy. The other one. The one who complains about it on nearly every comic.